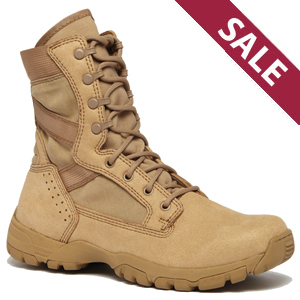 The Tactical Research TR313 Flyweight II Ultralight Desert Tan Boot is the U.S. Army approved version of the original and popular TR393 Flyweight boot. The TR313 adds compliance with the U.S. Army's AR670-1 regulation for wear with the ACU. This boot was built for light and medium duty applications. It is extremely light at a mere 17 oz per boot. This is a boot you'll barely notice you have on. They are still built for durability with triple stitching around heel, toe, and other high stress areas of the boot. An unlined upper and dual instep vents promote cooling and will keep your feet dry in hot weather settings such as Afghanistan.